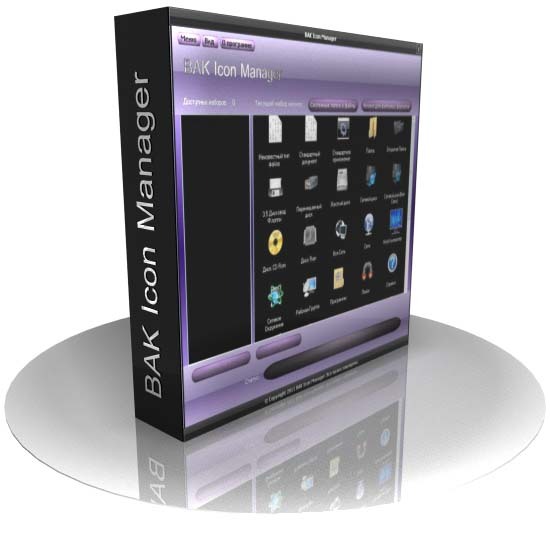 BAK Icon Manager - Replace images of system icons. Program BAK Icon Manager allows to replace images of system icons. There is a possibility to replace an icon for various file extensions and system folders. For convenient usage of the program it is possible to save icons in collections. Thanks to it it is possible to change two clicks of the mouse all accessible icons of system. Program works only with files of icons ".ico". If you have an image of other format, you should transform at first it to a format ".ico" by means of any indirect program, and then to use it as a new icon for a replaced system element. It is meant that the user already has files of icons on the computer which it would like to use in BAK Icon Manager. For single changeover of an icon in a program demo is it is necessary. The paid version already includes some ready collections of icons which can be installed on system. It is easy and fast method to make original appearance systems . Program Cost is specially installed such to be accessible to everyone.